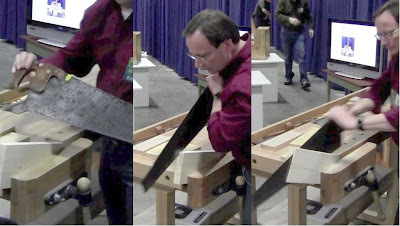 Resawing is the technique of ripping boards across their width to make thinner boards. It's useful for making things like drawer sides, box dividers, custom veneers, or slices for bent wood laminations. This is the alternative to planing thicker stock down, which wastes a lot of wood. 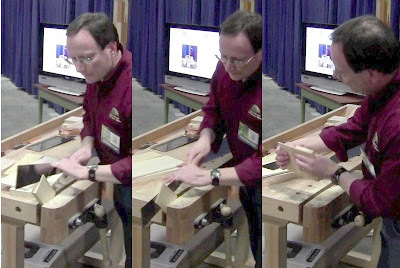 This past February I gave a demo on resawing by hand at WoodExpo in Boston, which Justin DiPalma recorded on video. I've edited the raw video down to the interesting parts for The Furniture Project website (recall that WoodExpo is now The Furniture Project). resawing an 8" piece of oak 1x4 with the ripsaw. These pieces took 10.5, 3.5, and 10.5 minutes to do. First piece, 2x6 with ripsaw. From left: my 26", 6 TPI ripsaw; starting the resaw; progress after flipping the piece a couple times. About halfway through; down the length to the far corner; opening it up to check the cut surface after doing the other end. Resawing by hand is definitely work, probably the most laborious operation you can do, so pace yourself and take breaks. But the point is, it's not that hard, it's definitely doable, and it gives you a lot of freedom, because it allows you to work in any thickness. 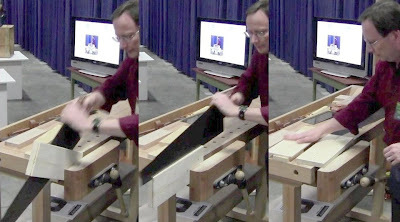 The technique isn't complex, just time-consuming (10 and half minutes to resaw a 14" length of 2x6). It's really just heavy ripping. You should take 10 minutes to sharpen your saw before any major resawing, then wax it to minimize friction. You should also minimize the amount of wood you're resawing by cutting the stock down to close rough width and length first. The resulting resawn surface may be pretty rough, but it cleans up quickly with planes. Just be sure to leave enough margin when you mark out the thickness you'll be cutting to allow for that. As you get better, you'll be able to get multiple slices out of the same piece should you need to do so. That's why I demonstrated the ryoba; I can get 5 slices out of a 3/4" thickness of wood. Just remember that the bigger piece, the more challenging, and the more chance of things going wrong (like when I tried to resaw a 12" wide piece of mahogany; the saw bowed inside the cut and eventually cut through the middle of the surface). Try some different sizes and different species to learn your limits. Second piece, pine 1x4. Starting in with the ryoba; halfway after flipping a couple times; comparing the two thicknesses. Third piece, oak 1x4. Making a starter kerf with a backsaw; working on the second corner; down the length; about halfway through. To resaw a piece, mark the edge all around, leaving adequate margin in the thickness for cleanup. Start at an angle on a corner, like you're sawing out a tenon cheek; sometimes it helps to make a small starter cut with a backsaw. You can either saw this corner all the way down until you reach the adjacent corner, or just saw down halfway to it, depending on how heavy the going is. Then flip the board and work from that corner. Once you've made good progress on the second corner, flip the board again and do more from the other side. Do this repeatedly until you pass the halfway point of the length. Then you can switch the board end for end and repeat the process on those corners. Eventually it all meets in the middle. You'll notice a couple of things. First, every time you start in from an edge, you're cutting a small triangular corner that grows in size and difficulty as you reach the other edge. Second, the existing kerf where you've already cut guides the saw, helping keep it straight. More frequent flipping makes it easier and keeps it more accurate. If you find it getting off track, flip it immediately and start from the other edge, but pay attention to the exit of the saw. If it's still getting off track, switch to the other end. This gives you a couple of chances to recover from mistakes. You can also raise and lower the angle of the saw as you work to change how it's cutting. Experiment with it. Lower it all the way to extend the kerf along the length so you can reach the far end. That then creates a starter kerf for working on that end. This isn't something you'll want to do a lot of, but it's a very valuable skill. You're no longer limited by the thickness of the available stock, and you don't need to waste large amounts of wood planing down for thin pieces. Good stuff, I just did this within the last couple weeks for the first time. It worked like a charm, and is a good way to do it if you don't have a band saw. And it really didn't take that long, so it's totally doable for a small piece, like for a box like I am working working on. Next time I will try the sawing down the sides when you're reaching the end, I think that could be helpful. Perfect timing. I have a project I was planning on working on today that needs resawing in this manner. I think I'll have a better shot at success now. Nice post Steve. I was surprised to see the japanese saw, I expected only western saws. For a one off job this info will come in handy. Very useful: I'm currently on my first year of a three year apprenticeship in Germany to be a trade guild recognised carpenter: unfortunately most of the training is based around massive and expensive machines rather than hand tools, which I'm more interested in. I'll be coming back often to widen my skill base. Oh dear, I forgot to add: thank you. Thanks! Workbike, I'm glad I can help out. It's unfortunate that professional training is omitting these skills. At Home Depot today I could NOT find some 1/2" pine hobby wood for a small tray. Remembered this post, so once home I whacked a 10" length from a 2 x 4, marked it 1/2" all round and set to with the rip saw. Point A: I was amazed the way my saw tracked. Point B: Yep, it was rough. Point C: 5~8 minutes with jack and smooth planes cleaned it up. Point D: The cut made a remarkable amount of sawdust. I made a board. Wow. Not perfect, and needs refinement to get it flat, but I DID it. Excuses for not making some things are *rapidly* disappearing. PS Our forefathers did this is not only in softwoods, but hardwoods too. We're in their debt. Miles, that's awesome! That's exactly the reason I post this stuff, to show you that you CAN do it! So Steve, here's the follow-up - a problem. I'm sawing some 1/2" boards cut out of a of 2 x 12 - the piece is 10" x 6", ripped from the "mother board" last evening. It had some cupping, so I dressed the convex side flat, marked for the cut and ripped it out. Felt very clever - I had worked on a thicker, easier to hand board, and one side would be smooth and grip the bench better when I planed out the saw marks. When the cut was finished the new board had an instant cup. Not a lot, but something I had hoped to avoid. Should I not have dressed it before cutting? Would it have happened any way and the rip just allowed stresses in the board to equalize? Proposed treatment right now is to simply leave it on the bench, cut side up, and see what happens. Your suggestions or observations will be welcomed. I think you're probably right, you just released the stresses in the wood, given that it cupped instantly. The fact that it was cupped to begin with may be a sign that this piece still had some issues. That original cupping may have been the result of differential moisture between the sides. I always leave pieces at whatever initial thickness I get them when I resaw, leaving as much margin as I can to deal with whatever issues might crop up. Then, if possible, stack and sticker the cut pieces and let them sit for a few days. That gives them time to do what they're going to do, cup, twist, bow, etc. Then clean up the final results. So like you say, let it sit and see what happens. But put stickers under it so air can circulate all around. Thanks Steve. I'll get on with the other pieces - same thing will likely happen. They may as well all settle out at once. The other thing I'd suggest is to look closely at the grain pattern, observe the orientation of the growth rings. You know how the original cupping was oriented relative to the rings, compare how the resulting movement is oriented relative to them. These pieces might prove a useful learning experience and science experiment, if perhaps less useful as a woodworking project! Done this quite a bit. Hard work yes. But great exercise too. I now have a bandsaw which is waiting to be fettled up for working. Then I can start on making a steam box. Thanks very much. Could you comment on how much planing you need to do afterword? 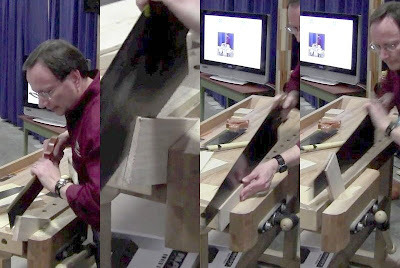 If you are a fan of Christopher Schwarz, you know that he recommends coarse, medium and fine: a foreplane, a jointer and then a smoother. Would you say all three are needed for the job of flattening and squaring up a resawn board? Yes, this very much needs coarse, medium, and fine. The resawn surfaces can be very rough and uneven. It's pretty much like rough-milled lumber, since after all a lumber mill is just doing a massive log-scale resaw job. I use a #5 with cambered iron for the coarse stage, making fast work of it, then #6 or #7 to flatten, and #4 to smooth. Since you'll generally only resaw fairly small parts, not whole boards, it's a quick planing job. Because of unevenness in the sawing, the whole process can easily eat up 1/8" of total thickness between saw kerf and planing.